Off of South Congress stands the massive, angular structure of Crux Climbing Center, the newest bouldering and rope gym to inspire Austin residents to place hand on rock. 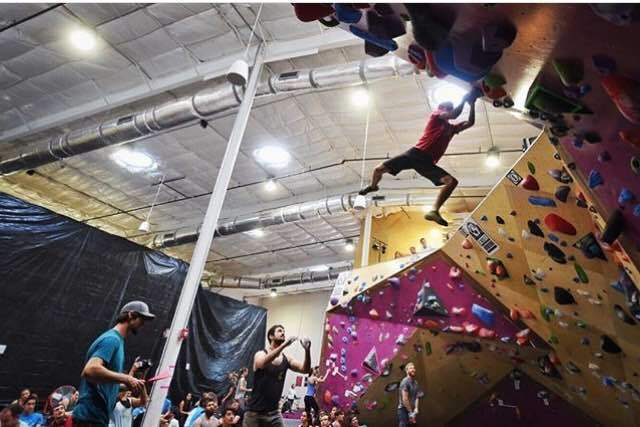 The 22,000 square foot facility opened on May 7, 2016 with a huge competition, Setter Showdown, that drew hundreds of climbers from around the United States. Local climbers Matt Twyman and Kevin Goradia partnered with East Austin architecture firm Derrington Building Studio to create a space that is incredibly unique to athletes, yogis and those searching for a gym with a comfortable but modern aesthetic. “Ultimately, our vision is to make it a home. Climbing is very community-centric, and people just want to have a place to go gather and hang out. Climbing is almost like a second part of it. You spend more time hanging out with friends. We wanted a place where people enjoy being that is comfy and clean as they climb, read, do yoga and whatever else,” shared Twyman. 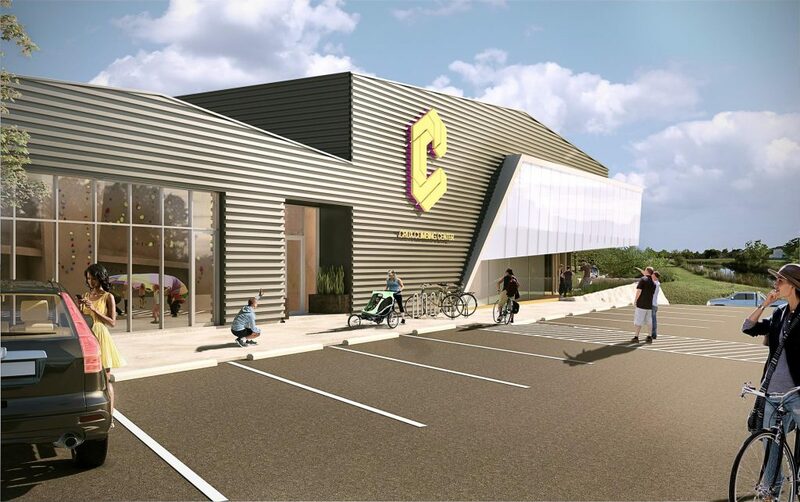 The general plaza on Pickle Street where the gym is located, dubbed “The Homestead,” is also home to The Infinite Monkey Theorem winery and will soon host another Buzz Mill Coffee site, food trucks and a dog park. “You can plan your whole day around this one site, and that’s what we’ve always had in mind where you can get coffee, go climbing and then go get wine. Everything you want to do in a day packed up. It’s more like a community space with that in mind. We’re always just trying to think of ways to bring everyone together,” said Goradia. Gazing at the building’s structure leaves you with the impression that this is a facility worth entering for sheer curiosity’s sake. The gym was designed with a climber’s perspective in mind. The architect and gym owners pictured the angular, sloped landscapes that climbers grapple with outdoors. It is unconventional and iconic with its glass façade that cantilevers over the main skeleton of the building, composing the lounge and beautifully open yoga studio that faces a nearby pond. “From an experiential point of view, we inserted the question of, ‘What is natively known to these rock climbers?’ We wanted to play with that idea with an iconic, simple form that you can see from South Congress, and then experience it differently when you start walking up. There’s a native intelligence about how to experience that part of the design.” -Blair McKay, Derrington Building Studio. Walking inside, you’re immediately made aware of the type of operation you’re entering. The guidelines of becoming a member are clearly outlined, and the retail section is expansive and high-end, offering quality apparel, gear and snacks from numerous brands. Registration is simple; you can even register online before you arrive, and a staff member will kindly orient you to each climbing area. Don’t worry about bringing any gear such as shoes, chalk, harness or rope. You can easily rent these items if you’re new to climbing (you’re welcome to bring your own equipment, too). There are numerous skylights within the gym, as well as wide windows to allow natural lighting and the impression of connecting with the outdoors. The gym hosts several rooms dedicated to bouldering and rope climbing. The walls are graded by the standard scales, and there’s also a fun V Scale-based grading system that uses a specific animal to denote certain grading ranges. The rope climbing area has walls that reach 30 feet high, featuring 27 anchors in total that can be utilized for lead anchors, top-rope and/or auto-belay, depending on the section. 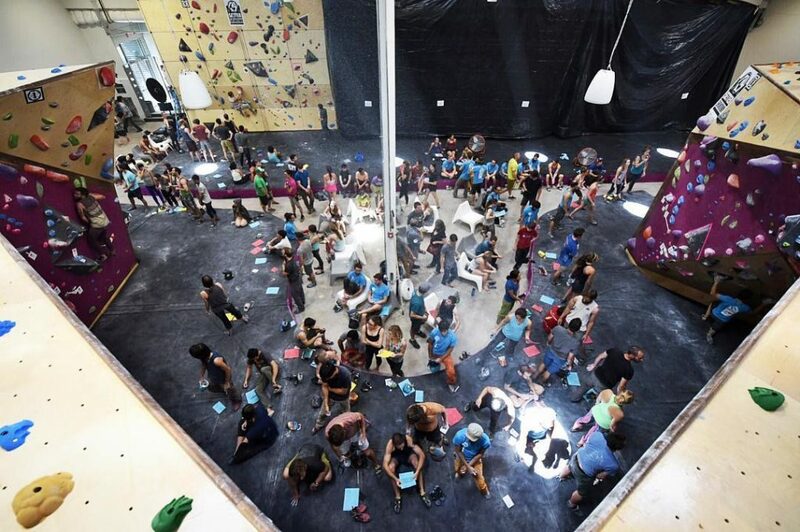 The main floor is occupied by bouldering walls with a vast amount of space dedicated to housing hundreds of people at a time without feeling cramped. 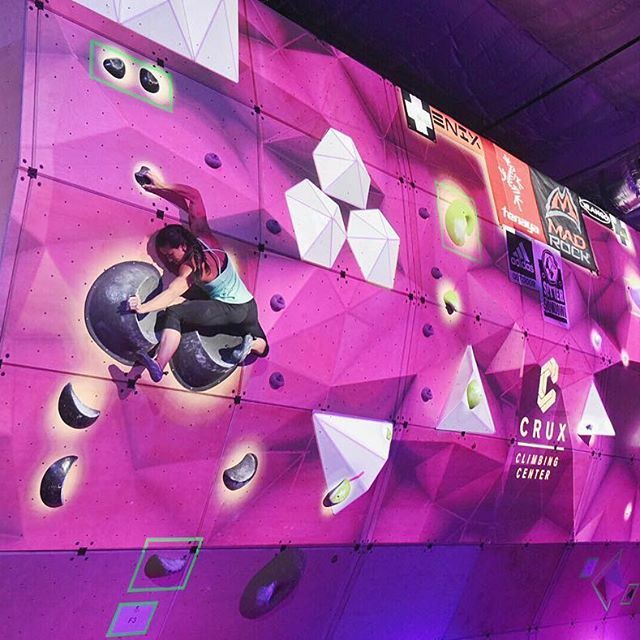 The Bouldering Corral features a wall that provides a varying terrain, with some sections allotting climbers the capability of topping-out to the mezzanine lounge area upstairs. My two favorite noteworthy features of the gym are the Future Wall and the Thunder Dome, as they are both remarkably one-of-a-kind. The Future Wall is a reconfigurable wall that the gym has built around as a focal point. The engineering enables setters to continually change the landscape of the wall and thereby alter the types of bouldering problems that the gym can offer to climbers. Infinite variability is possible, and this is especially exciting when considering how that impacts competitions Crux Climbing Center will hold in the future. The Thunder Dome as a bouldering cave is a beautiful space that has two major pros: it’s open 24/7 if you subscribe to the More Awesome Membership option, and you can hook up your own music to jam in the cave. “They’ve created a space that people want to come to that goes beyond just training and inspires you to climb more. It’s very inviting, has a great lounge space, and the people, environment and high-end factor is well-considered,” said Grace Nicholas, Crux’s Community Manager. There is a separated kids area titled the Panda-Monium Room, which is intended for the twelve and under crowd of young climbers. It’s a space designed for birthday parties and big events and features not only climbing, but also a slide and fireman’s pole to keep attendees well-entertained for hours. Upstairs sits the fitness area that is well-stocked with strength training and cardio equipment and a lounge area to read, work and hang out. You can also use the gorgeously simple, open yoga studio that faces the pond and street below. Check the schedule online for class variety and times. Beyond climbing, Crux Climbing Center’s staff hopes to take events to the next level as they transform the gym into a community space catering to various interests, more than solely a climbing gym. The Community Manager is planning to host events such as an upcoming mural night for artists to have their work produced and featured as patrons climb and music spins. Other activities include morning coffee gatherings, date nights for parents, dog play dates and weekly wine nights. They are just getting started. “A big part of Matt and I’s dream is to just keep reinvesting in the community. That’s why we opened it. We’re looking toward getting to a point where every week we have one to three events and, hopefully, we just keep expanding. We want to bring as many people in this gym from as many walks of life as possible,” said Goradia. Crux Climbing Center is located on 121 Pickle Road off South Congress. For more information and updates on Crux Climbing Center, visit their website, Instagram and Facebook. Derrington Building Studio is located on 2400 E Cesar Chavez St, #302. For more information and updates on the studio’s work, visit their website. Where do you climb in Austin?